Freedom is pretty pleased that we decided to keep Zelda. He is, in fact, quite taken with her. She enjoys the attention . . . up to a point. He can be a bit too persistent, leaving her begging to go back in her stall. To give them the chance to get to know each other, awhile ago I let him hang out in her paddock, giving her the option to retreat back into the safety of her stall. But I think she’s starting to like him. Good morning, I’m hoping you may be able to answer a question. 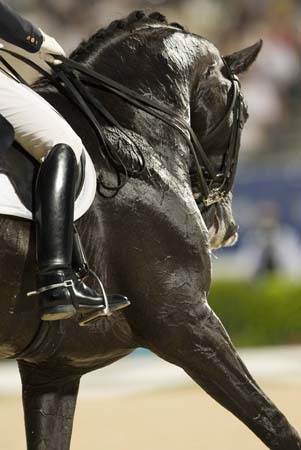 I came across a wonderful dressage photo (head shot of a black horse) from one of your blog posts Nov 6 2009. I am interested in using it in an acrylic painting only if I have permission. How do I go about doing so? That is a photo of Anky Van Grunsven. Here’s where it came from. You would need to contact the photographer about that. My guess is that if the image were changed enough, it would simply be a black horse in a dressage format. I’m not clear about the copyright laws that would be involved if you were to take inspiration from a photo that was published online.